Sainte-Foy–Sillery–Cap-Rouge is a borough of Quebec City, Quebec, Canada. The borough was created on November 1, 2009, from the former borough of Sainte-Foy–Sillery and part of the former borough of Laurentien. 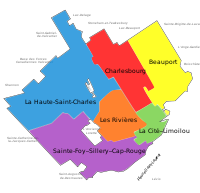 Those boroughs in turn had been created on January 1, 2002; on that date, the former city of Cap-Rouge, a small part of the former city of Sainte-Foy, and other territory went into Laurentien, while the former city of Sillery and the rest of Sainte-Foy formed Sainte-Foy–Sillery. This page was last edited on 27 November 2018, at 12:43 (UTC).